To the eye of a practical farmer, Grand Island presented in its wild state, has the most charming attractions. This island is so called to designate the land lying between Sycamore Slough and the Sacramento River. The soil is all of a light alluvial deposit and is very rich. The growth of wild oats, clover and other wild grasses was so rand as to almost make one question the truth of his own eye – sight. The island is formed by Sycamore Slough, putting out from the river about six miles below Colusa running into a tule, which again finds and outlet by way of another large slough into the river at Knight’s Landing some thirty miles below. The greatest width of farming land is about six miles. 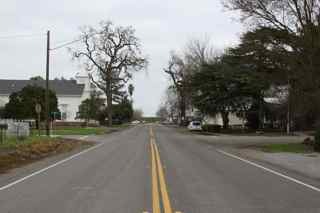 It is thickly settled and was one of the first districts in the county to be located upon. Grimes in the most important village on the island, and is located about six miles below it’s head. It is names for Cleaton Grimes, who located here in 1851, building a cabin on the riverbank near to where his orchard now stands and where he still resides. A handsome Baptist church has been erected here. There is also a large, roomy hall for public gatherings and the meeting of several benevolent societies organized here. Besides a large warehouse for the storage of grain, there is one hotel, on general store, two saloons, one blacksmith shop, one harness shop, and a barber shop. Eddy’s Landing, about a mile below Grimes, is afforded communication with the east side of the river, the Marysville Road, by means of a ferry. Steamboats make regular trips up and down the river, hauling away the produce and returning with freight for its stores and farms. Grand Island is populated with a thrifty class of people.